Last week, we tortured you with coverage of the first half of a Mammoth Town Council strategy session. Below, Gorman covers Council’s discussion about housing, capital infrastructure and municipal services. 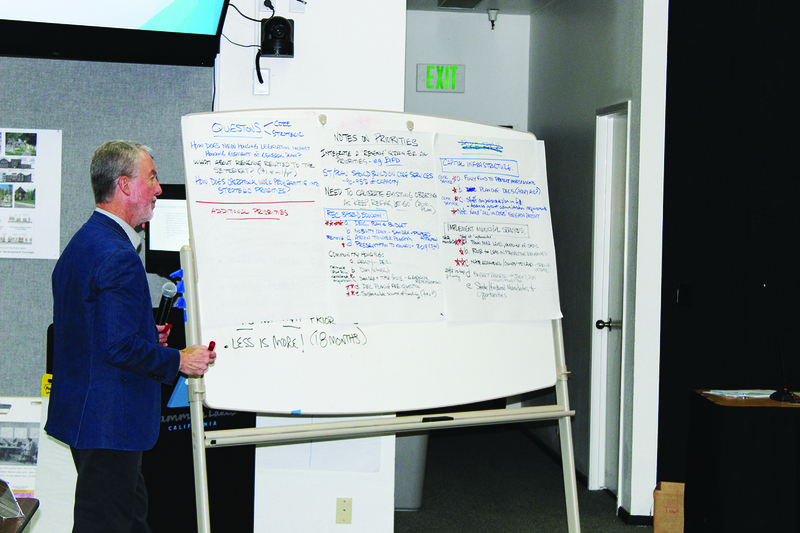 The strategy session covered Council’s vision and goals for the next 18 months. Item d was the stated number one priority for Hoff, Wentworth, Salcido, and Stapp. Sauser mentioned the fact that the Town has spent about $9 million dollars on the parcel and other expenditures and has seen zero additional units as a result. At that price the town could have purchased about 90 condos at market rate. Councilmembers came to a consensus that items a and c are simply core services of the town, and shouldn’t be included on this action item list. Core services are essentially mandated, and therefore don’t need to be prioritized. Since the others are core services, the Councilmembers agreed that b could be the only top priority. A victory for High School Geometry! Most of the councilmembers felt that item b, financial stability, was too broad and belonged in the list of core services. Wentworth said that his number one priority was solid waste. “We’ll get bit bad if we don’t take care of that,” he said of the impending Benton landfill closure. Soon Mammoth Lakes will have to ship its waste to Nevada. Salcido said that c, a new safety communications service was her top priority. Chief of Police Al Davis said that 24/7 services is his top priority. He added that with current staffing the police department could have an officer on duty 24/7, it just needs to adjust its scheduling policy.